Scientists have found that vampire bats can survive on a blood-only diet because of genetic and digestive differences which have evolved over time. Which of these 'blood' idioms means that family relationships are closer than friendships? A new study has found that vampire bats have undergone many genetic changes to be able to live on a blood-only diet. The three species of bats are the only mammals to feed exclusively on blood. The study found that vampire bats' genes involved in immune response and metabolism are very different from the genes of other bats. 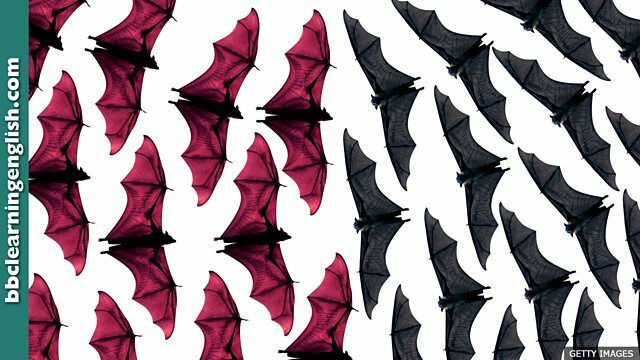 The study also found that the microbes in their guts are very distinct from those of the fruit and insect-eating bats - giving vampire bats protection against diseases. If something is bloodthirsty, it enjoys violence. Which of these CANNOT be described as bloodthirsty? Their bodies have changed over time. Why can vampire bats survive on a blood-only diet? He depends on them, he doesn't eat them. He has no job and lives at home with his mother and father, who give him food and money. He ______ his parents.